LAHORE: (Friday, November 9, 2018): Punjab University Centre for South Asian Studies has signed a memorandum of understanding with Lahore Centre for Peace Research to promote regional peace and stability. 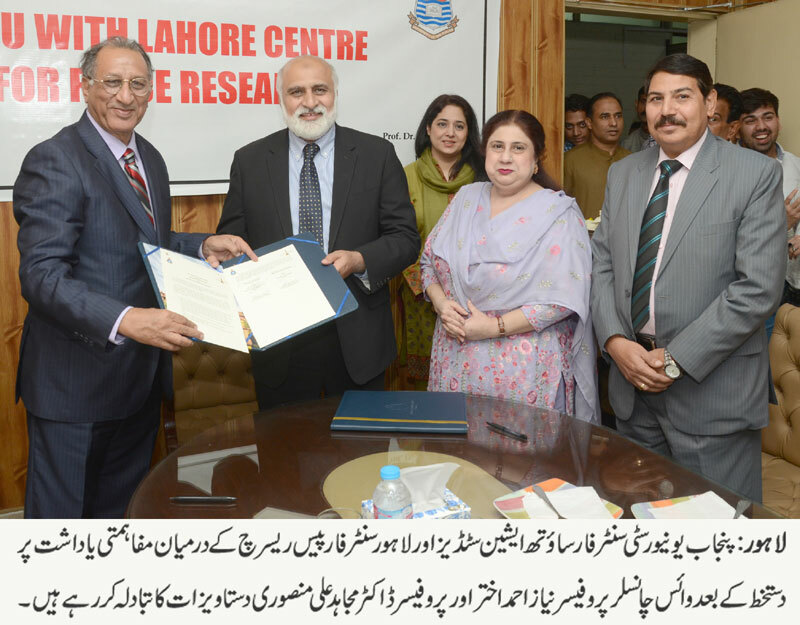 In this regard, an MoU signing ceremony was organized at CSAS in which PU Vice Chancellor Prof Niaz Ahmad, CSAS Director Prof. Dr. Umbreen Javaid, LCPR Executive Director Prof. Dr. Mujahid Ali Mansoori and others were present on the occasion. As per agreement, CSAS will provide facilities to LCPR for conducting research in shape of access to library, online research journals and other sources of guidance form its own faculty members and research scholars. LCPR will collaborate with CSAS for organizing seminars, symposiums, conferences and workshops to promote research culture with reference to peace and harmony. Both the parties will provide opportunities for their researchers, visiting scholars and experts to access facilities at both institutes for research projects and cooperation regarding their mutual interest. Research Scholars of both the institutions will produce joint research papers on agreed areas. LCPR will encourage the participation and visit of the CSAS’s Ph.D/ M.Phil scholars in its activities.